If you are considering yourself a fashionable person, then it will be the great idea to decorate your patio with suitable furniture. DIY outdoor furniture ideas will bring much architectural beauty in our patio. Before starting the DIY patio furniture plan, you need to understand the possibilities that lay in your yard. It seems very awkward to try to create our own patio furniture, but this article will show the road with plans for every patio furniture. You will know about some patio chairs, tables & beds. Therefore, after reading this article you may choose the patio furniture, which is good for your courtyard. We also tell you that how you can decorate these types of furniture. So, take a look to acquire more ideas about the DIY project. Sometimes a potting bench looks like a wasteful and extravagant thing in your yard. However, you can properly decorate your garden with DIY cedar potting bench. It is a bench, which contains built-in potting soil container, dirt catcher. If you are searching, a suitable DIY patio furniture then cedar-potting bench will be the best. You can design it yourself. This potting bench includes everything you need to build a strong and beautiful wooden bench. This outdoor furniture will add rural beauty to your patio. It is a simple project. You can make it yourself within three days. Generally, this bench is painted off-white and decorated in a vintage way. Above this bench, you can keep some decorating things like a well-covered pillow. Lattice-Hatch bench generally stands beside a wall. Suppose you spent more time and hard word to decorate your patio. Now it is time to spend some time with your family, friends & neighbor in your beautiful patio. As a result, your guests will be needed drinks, snacks & tea. Therefore, you can use a DIY patio rolling cart. It looks simple. As it makes with wood, it will definitely match all of your DIY furniture. For decorating DIY patio bed or DIY patio bench or DIY patio chair you need some well-covered cushions. A cushion is mainly a decorating thing. So, you have to select well-matched cushion according to your furniture. However, DIY patio furniture cushions will be a great decorating thing for your DIY projects. After working the whole summer, you need to take some leisure time. You can seat before your deck under the sun. There you need a comfortable seat, which makes your body relax. Scarp Adirondack is that kind of patio furniture. It stays very low to the ground & back part is laid-back. Therefore, it seems very comfortable & fashionable. This bench is made in pallet style. This charming bench is called picket fence because of its structure. We all know that the picket fence is a kind of fence that is used for creating boundaries in the domestic arena. Two pieces of the thick fence are crossed to create a resting area. You may try this bench with a comfortable cushion seat in your patio. Who doesn’t want to rest with a swing bed? After a long day of working you can take rest in the evening with a swing bed. All you have to do is that you need a suitable place to hang your bed. Are you thinking of a DIY project? Yes, now you can do it by yourself. It’s very easy to make a pallet swing bed. Cut the wood pieces according to your desired size and add them with screw and glue. Hang the bed into a suitable place. Your bed is ready to use. On the cold season, this DIY outdoor patio furniture can really help you to remain warm. Sounds good, isn’t it? You can make this DIY project easily in your workshop. Just take your basic tools and dig a certain place into your table. You can use a reciprocating saw to do so. You will add Steel frame inside of the dug hole. It is very much stylish outdoor furniture. You can place it in your garden and enjoy the night. Now it’s easy to enjoy the time with friends and family in a circle table. You can create your opportunity on your own by making a pedestal picnic table. Your outdoor furniture plans will represent your creativity as a woodworker. To cut a perfect circular size wood plate you can use your pencil to mark the place first. For marking or drawing a circle you may fix a rope into the middle point of the wood plate and another side of the rope you can take a pencil to draw the circle. And the basement is very easy to create. The table looks very good. It looks very gorgeous basically on the outdoor. You can make this in your workstation. You will be required the basic tools and machines for making this DIY project. Make a basement by using 4 legs. Then you will place the stool top by adding glue or screw. After that, for increasing the beauty of the comfy stool you can add wood pieces around the legs. It will give a nice outlook. You can see and take care of your garden by sitting on the comfy stool. Your choice your creativity! You can make as many DIY projects as you want. It’s totally up to you. You are a woodworker and after buying the basic and advanced tools and machines you are ready to create new amazing DIY projects. You can take the woodworking as your profession and try to build new gorgeous DIY projects. Never give up if you face any problem and give safety the first priority while working. 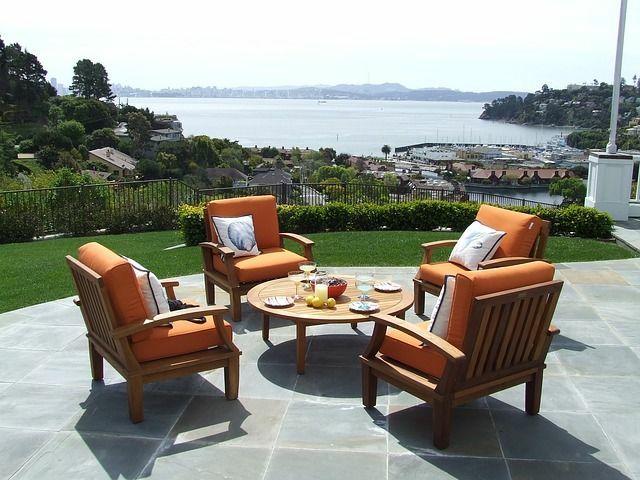 Your outdoor furniture plans can amaze people and your visitors. Always try to complete your DIY work perfectly. That is all for today. Hope that you have got some ideas. Make sure that the ideas are working for you.